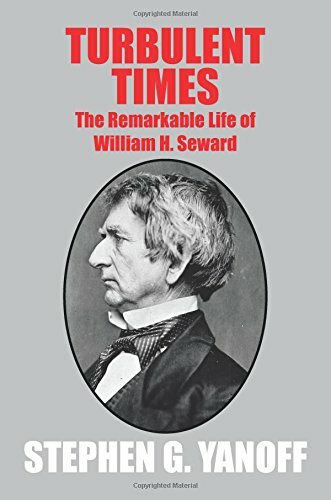 “Turbulent Times: The Remarkable Life of William H. Seward” by Stephen G. Yanoff is a remarkable book about a little-known historical figure. In fact, my first reaction was to ask, “Who?” I am no historian, but as soon as I saw references to the Alaska Purchase I was like, “Oh, him.” However, Seward is obscure enough and interesting enough that he makes excellent subject matter. It's clear from the first chapter that the author and, may I dare say historian, Stephen Yanoff, went through great pains to do the research on Seward and the time in which he lived. More impressively though, Yanoff references the historical documents he used throughout the book. He even includes his notes and bibliography in the back of the book. “Turbulent Times” starts early in William Henry Seward's political career, or really the lack thereof, and follows him as he becomes President Lincoln's secretary of state, and during his purchase of Alaska. It reads like a well-written documentary, and while heavy on the politics of the time, does not forget to also treat Seward as a person, often giving the reader a personal and sometimes intimate look at Seward's home life and business dealings. Yanoff takes great care to explain the historical context in which Seward lives, again often using other written works from the time. These insertions of pieces that are not directly related to Seward but to the time are especially nice since the author could have bypassed them completely. They not only make the book a joy to read and the reader feel like he or she is really riding along with Seward, but they also show the time and dedication that Yanoff put into this work. Now this book is excellent, but it is also for people who enjoy watching PBS documentaries on Netflix or falling asleep to Antique Road Show. This is, after all, a historical work about a secretary of state. However, if you're okay with that then you are in for a great read. All in all, I give “Turbulent Times: The Remarkable Life of William H. Seward” by Stephen G. Yanoff, 4 out of 5 stars because it is well-written, spectacularly crafted, painstakingly researched, and well worth your time.